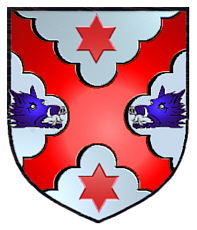 A silver shield with a red engrailed saltire between two red mullets in chief and base and blue boar's heads erased on each side. Motto: Spem successus alit - "Success nourishes hope". 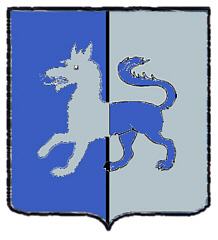 Coat of Arms: A silver and blue shield with a blue and silver wolf. 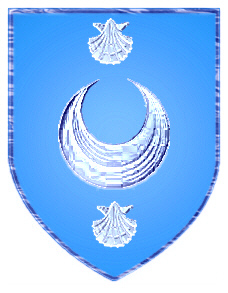 Coat of Arms: A blue shield with a silver crescent between two escallops. 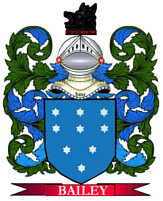 Coat of Arms: A blue and silver shield. Definition: Patronymic surname meaning "son of Andrew." Andrew (man, manly) was the first of Jesus' disciples, and was a revered name in medieval times due to its church connections. St. Andrew is the patron saint of both Scotland and Russia. Many Danes, Norwegians and Swedes who emigrated to America with the last name Andersson or Anderssen, dropped the extra -S after their arrival. As St Andrew is the patron saint of Scotland, it is perhaps not surprising that the name 'son of Andrew' is common over much of the country. The Gaelic derivation of the name 'Gilleaindreas', gives the name 'Macandrew' and other variations. Grimble states that although arms were granted to an Anderson of that Ilk in the 16th century, the name is so widespread that no exact place of origin can be established. Black lists Andersons as burgesses of Peebles, and also in the county of Dumfries. John Anderson was commissioner to Parliament for Cupar in 1583. Alexander Anderson was a famous mathematician born near Aberdeen, who later settled in Paris, where he published works on geometry and algebra. His kinsman, David Anderson of Finshaugh, had a similar scientific bent and is renowned for removing, by the application of science and mechanics, a large rock obstructing the entrance to Aberdeen harbour. William Anderson published his famous biographical history of the people of Scotland, The Scottish Nation, in 3 volumes in 1863. He praised the more charitable activities of the family by stating that David Anderson(the rock remover) was also rich enough and generous enough to found and endow a hospital in Aberdeen for the maintenance and education of ten poor orphans. In the 20th century, the name is remembered for the famous Anderson shelters. Their is no chiefly line at present but the major cadet branches have been identified as those of Dowhill, West Ardbreck and Candacraig. The Anderson Clan Society was formed in 1973 and is now active throughout the world, and a clan room and archival display are maintained at Wisby House, Kirtlebridge in Dumfriesshire. The Ainslie arms clearly allude to their early crusading exploits but eve in more recent times they have enjoyed high military rank. General Charles de Ainslie commanded the 93rd Highland regiment at the Battle of Balaclava in 1854 which has now passed into legend as the thin red line. The family were also distinguished lawyers, and David Ainslie of Costerton, who died in 1900, left a fortune amassed from his legal practice to build the Astley Ainsley Hospital in Edinburgh. There is a memorial to the family on the wall of the parish church of South Leith.